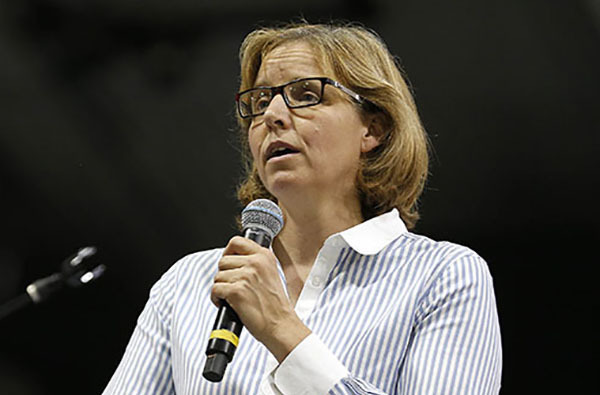 Megan Smith, U.S. Chief Technology Officer and Adviser to the President, addresses the Chief Science Officers on Wednesday at GCU. 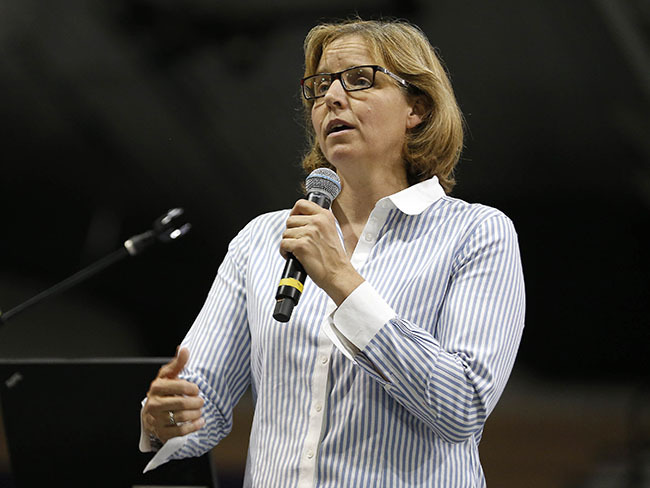 With a bounce in her step and a grin on her face, Megan Smith, the U.S. Chief Technology officer and adviser to the President, congratulated some 200 Chief Science Officers gathered in Grand Canyon University’s Antelope Gym on Wednesday. Smith said Arizona’s program could become a model for the rest of the country. Smith and two other White House officials — Marc Wynne of the president’s Leadership Development Program and Andrew Coy, a senior adviser — traveled to GCU to meet the young men and women who were elected by their classmates to promote Science, Technology, Engineering and Math (STEM) at their schools. “We want to congratulate you for getting this started in Arizona,” Smith said. Officials from Idaho, Michigan, Missouri, Nevada, Washington, Oregon and New York were also at GCU to gather information about starting the program in their states and planned to meet with Smith later in the day. GCU is a sponsor of the Arizona CSO program. It was launched in 2015 by Arizona SciTech, headed by executive director Dr. Jeremy Babendure. This school year marks the second year of the initiative. In her remarks, Smith praised Babendure; Susan Farretta, the Arizona Technology Council director of educational initiatives; and program sponsors for setting the pace for the rest of the nation. 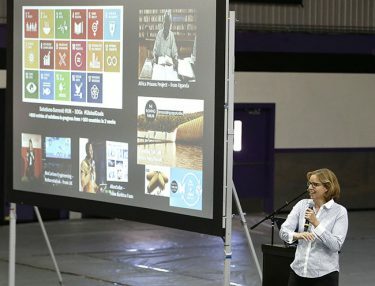 Smith provided examples of creative solutions to some of the world’s problems: how a lawyer shortage in Uganda was solved by teaching the law to prisoners, how deforestation was eased by drones that plant trees in the ground, and how a ship that was retrofitted into a maker space with 3D printers travels to school-age children from Peru to Brazil. “Everything around you has been designed and made. You can be the ones who design and make things,” Smith said. She suggested events they could organize at their schools, such as coding boot camps and hack-a-thons. She also challenged the CSOs to reverse the bad rap that STEM subjects get. They are not too hard, too dull or just for boys, she said. “One of the things we’ve been struggling with as a country is how to make everyone feel powerful,” Smith said. During a question-and-answer portion, a student asked Smith about her highest hopes for CSOs. CSOs are in a position to empower others, she said, and she hopes they spread confidence, creativity, collaboration, caring, kindness and intensity.